Mayor Linda Jackson says she was unaware of the apparent mismanagement of her 2006 campaign finances that has now placed her job in jeopardy. But if she didn’t know what was going on with her election dollars, her husband and campaign manager Mario Campese did, according to auditors Ken Froese and Glen R. Davison, who uncovered several apparent contraventions of the Municipal Elections Act. Acting on the audit report, council unanimously chose to appoint municipal lawyer Timothy Wilkin of Kingston, Ont. as independent prosecutor after a four-hour closed-door meeting Tuesday afternoon. It’s now up to Wilkin to determine what charges to pursue against Jackson. If found guilty, Jackson could be expelled from the mayor’s office. October 2006: Leaked emails. Conversations with police. Even before being elected, then-regional councillor Linda Jackson is embroiled in controversy. Jackson vows to bring change to Vaughan, saying it’ll take a front-end loader to clean-up city hall. November 2006: On election night, Jackson wins mayoralty by 90 votes. DiBiase wants a recount. April 2007: A court-ordered recount confirms Jackson’s triumph over DiBiase — again by 90 votes. May 2007: Gino Ruffolo and Quintino Mastroguiseppe ask city council for an audit of Jackson’s 2006 campaign finances. Council defers and the pair appeals. December 2007: The Ruffolos launch legal action against Jackson, saying she breached the Municipal Conflict of Interest Act. February 2008: Court orders audit into Jackson’s campaign books. 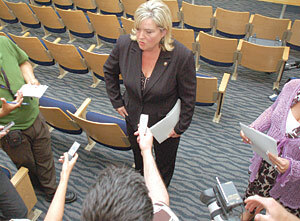 April 2008: The embattled mayor reaches out to local media to speak out against her critics. She also circulates an open letter decrying the city’s “climate of controversy” and the “personal and professional abuse” she endures. May 2008: City’s audit committee orders a forensic audit into Jackson’s office finances. June 2008: Jackson’s front-end loader runs out of gas. Council unanimously agrees to press charges after an audit of Jackson’s campaign finances finds apparent contraventions of the Municipal Elections Act. With her job hanging in the balance, the embattled mayor put on a brave face for reporters after learning her fate was now in the hands of an independent prosecutor. “Had I been aware, would I have condoned any of the practices that have come to light in the audit?” Jackson asked rhetorically in a statement on Tuesday. The audit report seems to back Jackson’s claim that she was unaware of any wrongdoing, essentially hedging her responsibility over her campaign’s finances by shifting some blame to Campese. Not knowing about financial mismanagement doesn’t absolve the mayor from all responsibility — she could still be found guilty. But in this case, ignorance may be bliss and her job may be saved, says Jack Siegel, a lawyer at Blaney McMurtry and an authority in election and political law. Wilkin has also been asked by council to establish what penalty to recommend to the court if Jackson is convicted. “He’s authorized to take the whole matter to conclusion, to consider everything that’s in the compliance report, to determine what items there might be evidentiary support for and therefore to use those as the basis for the full charges,” Councillor Tony Carella said after council’s vote. • failure to provide direction to the campaign manager in relation to delegation of the financial aspects of the campaign. Quintino Mastroguiseppe and Gino Ruffolo were the two Vaughan residents who originally pushed for the audit. Their lawyer, Eric Gillespie, was involved in a similar case in which he was successful in acquiring a court-ordered audit of the 2003 election finances of Larry Di Ianni, Hamilton’s former mayor. In what could be described as déjà vu, Wilkin prosecuted Di Ianni — who did plead guilty to six charges of donation irregularities — for apparent contraventions of the act outlined in the audit that was prepared by Froese. Siegel was on Di Ianni’s legal team, though he did not act on the charges. “The law is confusing and very complicated to understand,” Di Ianni said by email last week. “I would venture to say that many, many candidates have had errors on their returns of one kind or another. In a moment of candour following Tuesday’s decision, Councillor Alan Shefman expressed his regret that city hall had become mired in controversy. In the event Jackson is found guilty and removed from office, Regional Councillor Joyce Frustaglio would assume the mayor’s role because she received the most regional council votes in the 2006 election. Frustaglio, however, also faces an audit of her campaign finances.